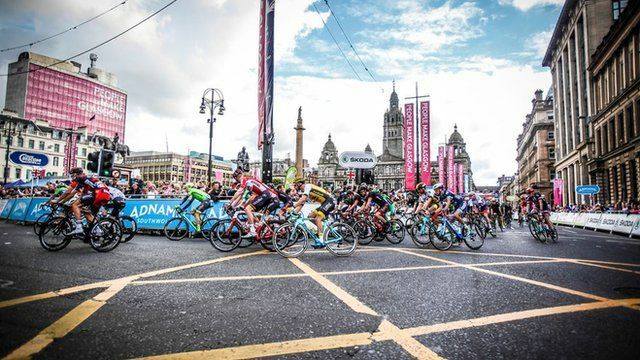 Thòisich rèis baidhsagail an Tour of Britain am meadhan baile Ghlaschu Là na Sàbaid, le na farpaisich a' deànamh orra sìos a Chaisteal Dùghlais. 'S e Andre Greipel às a' Gheamaillt a' bhuannaich a' chiad earrainn agus Mark Cavendish a' tuiteam aig an oisean mu dheireadh. 'S e seo an treas turas a tha an rèis air tòiseachadh ann an Glaschu, agus bhruidhinn Ailean MacLeòid ri dithis, Kerry agus Ciorstaidh Nic a' Phì, a bha gu math toilichte na rionnagan mòra fhaicinn faisg air làimh.